Recovering Working Mom: Water logged, diamonds and a hand pump . . . Wait, I think things are getting all jumbled up in my brain! Or, maybe I just wanted to see if any of you would open the link. Ha! Family fun was jam packed today. We started with an amazing ride on our boat in San Diego Bay. The weather could not have been more perfect and we had a blast. 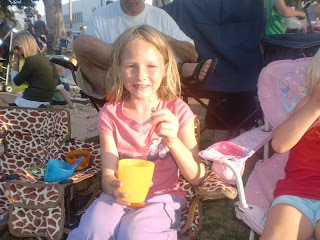 Then, it was on to the Diamonds are Forever concert in Coronado. So you now know what the water logged and diamonds come from . . . what’s with the hand pump?! 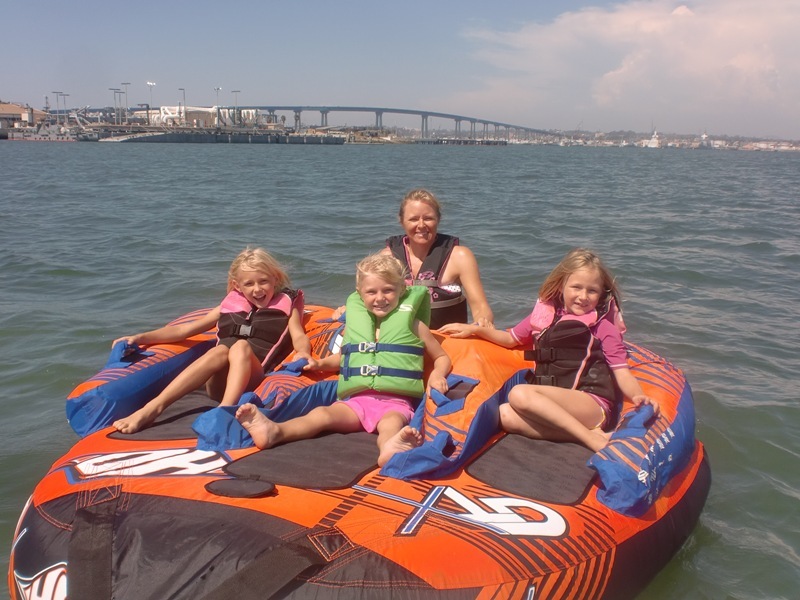 1) When you decide to jump on the back of the giant inner tube that your children usually ride behind the boat, make sure that if you are wearing a bikini top you put on the small neck strap that holds the top up. My boobies aren’t exactly as sturdy as they used to be and can’t really hold much up, especially when they are bouncing up and down for 30 minutes. Thank God for the life vest I was wearing that covered things up. 2) When you are packing the picnic dinner for the outdoor concert you are going to, be sure to remember to take paper plates and plastic silverware. Otherwise, you will find yourself raiding your parent’s condo for plastic ware to use for dinner. Of course, I learned an additional lesson here – don’t let your husband pick out the items. If you do, you will end up with 3 plates, 1 bowl and 15 cups. Although my parent’s condo had more plates, he thought it would be better for us to eat our salad out of cups. It was just easier that way. Granted, his idea was apparently better than mine which was to go to Vons and buy some plastic ware. At the time we had to make the decision we thought we were late for the concert and I would miss half of it because it was supposed to only last an hour. Turns out, it started ½ hour late and lasted 2 hours. I could have actually driven back to our house ½ hour away, pulled out plastic ware from our pantry, driven back down to the concert and still been able to enjoy most of it. I give my husband kudos for thinking on his feet, but then we had 15 cups to clean. And yes, Nana, we did clean of them and left them at the condo. 3) When you are at the concert you will discover that after the sun goes down and it’s too dark for the kids to play on the playground and there is a big pile of ice on the lawn where people left it to melt, your children will play for an hour in that ice. Who knew that just throwing a big pile of ice on the lawn would make so much fun?! A repeat of this is coming to a blog near you soon! 4) And finally, when you arrive home and realize that Grandma and Grandpa are using your oldest child’s bed and therefore you need to blow up the air mattress in the middle child’s room, do not ask your husband for a pump to blow up the mattress. If you wanted to blow up a giant inner tube, he’d have an electric powered pump that will fill the thing in 3 seconds flat. What he will actually bring to you for your project is a hand pump that you have to pump yourself. He will then tell your 7 and 9 year old that they should take turns pumping. Seriously, after 6 pumps the 9 year old says “is it time to trade yet?” I think we all know how this one ended – with me pumping the damn thing up. It’s a good thing I didn’t have time to work out today. Between holding on for dear life on the inner tube and pumping up the inflatable bed, I’m pretty well set on my bicep workout!